The Prime Minister urged the youth of the country to develop better communication skills for the betterment of the society. He said that the words one speak may or may not be impressive but it should definitely be inspiring. He asked the youth of the nation to take up various issues and debate on it. Young people have the advantage of freshness and new ideas, enabling them to face new challenges more effectively, PM said. Prime Minister expressed hope that National Youth Parliament Festival platform would provide direction and shape to the energy of the youth and a better dialogue process. He said that such events would aid those aspiring to become Parliamentarians. Earlier, the award winners had the opportunity to share their thoughts with the Prime Minister. The Prime Minister also interacted with the participants of the festival. 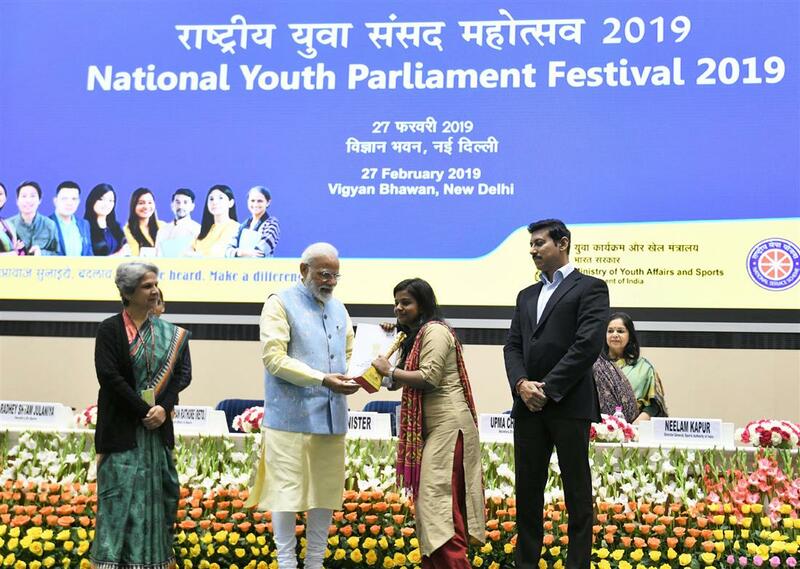 National Youth Parliament Festival 2019 has been jointly organised by National Service Scheme and Nehru Yuva Kendra Sangathan under the aegis of Ministry of Youth Affairs and Sports on the theme of ‘Be the Voice of New India and Find solutions and Contribute to Policy’.